Entrants are asked to create a diorama, not to exceed 3 feet wide by 2 feet deep by 2 feet tall. Then they should take a photo of their dioramas and submit their entry at http://woobox.com/knsexw by Monday April 3, at 11:50 p.m. EDT. The photo is to include an accompanying sign no bigger than 12" x 3" with the name of the diorama. Information to be included with the submission is the entrant's name, age, hometown, phone number and email addres as well as the names of any other contributors to the diorama. Six submissions will be selected for the finals. 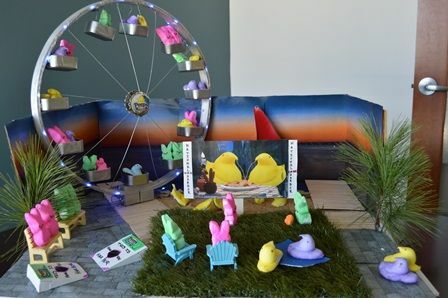 The selected finalists are to take their entries to National Harbor April 8 for National Peeps Day by 11 a.m. Judging for the Peeps Choice Award will begin at noon, and will be done by a popular vote by the Peeps Day audience. Complete Diorama Contest rules and regulations are available on the National Harbor website, www.NationalHarbor.com. Peeps Day includes a variety of activities along with contests and prizes. The National Harbor World Peeps Eating Contest will take place at 1:30 p.m., with the No. 2 world-ranked competitive eater Matt Stonie (San Josie, California) and No. 11 world-ranked Juliet Lee (Gaithersburg) returning to defend their world record titles set last year. Stonie won the event by eating 200 Peeps in five minutes. Juliet was the highest ranked woman competing, having devoured 140 Peeps. Ten of the top eaters in the world will participate. To see all of the Peeps Day activities, visit www.nationalharbor.com. The Peeps & Company store at National Harbor was the first in the country and there are only two others. Peeps (the popular marshmallow candies shaped like chicks and bunnies) have become an iconic symbol of spring. Peeps® are made by the family-owned company, "Just Born," headquartered in Bethlehem, Penn. and founded in 1923. Over time, the candy line has expanded to include bunnies and a wide array of colors and flavors. For more information, visit www.NationalHarbor.com. National Harbor is a community unlike any other. Situated close to the nation's capital, National Harbor takes full advantage of one of the country's most historic rivers. Rising from the banks of the Potomac River, just south of the Woodrow Wilson Bridge in Prince George's County, Md., National Harbor is a 350-acre mixed use development with seven hotels (including the Gaylord National Resort and Convention Center and MGM National Harbor), offices, residential, tree-lined streets with more than 160 shops including Tanger Outlet and more than 40 restaurants, iconic attractions such as the Capital Wheel and National Harbor Carousel, and much more. The community provides easy access to Washington, D.C. and Alexandria, Va. and features an array of waterfront activities, events, and spectacular sunsets. For more information, www.NationalHarbor.com.